Costa del Sol is by far the UK's most popular Spanish destination. The sunshine coast has an average temperature of eighteen degrees so visitors can enjoy the resorts at any time of year. Located in Andalusia on Spain's southern coastline, the Costa del Sol has stunning beaches, warm seas, dozens of golf courses, great shopping and some of the liveliest resorts in the country. Lots to see & do on the Costa Del Sol. With natures reserves and animal parks, deep sea fishing and dolphin watching, aqua sports and water parks, botanical gardens and golf courses, theme parks and adventure parks, Costa del Sol holidays have much to offer. They attract a wide variety of visitors from all age groups. Whether you are seeking a peaceful retreat where you can recharge your batteries; enjoy a round of golf on sumptuous courses; or require a bucket and spade holiday with safe bathing for children; or belong to the eighteen to thirties wanting sun and sea by day, followed by party nights; there'll be a cheap Costa del Sol holiday to suit. Where do I stay in the Costa Del Sol? Choose your resort with care and you'll find that Costa del Sol can be all things to all people. 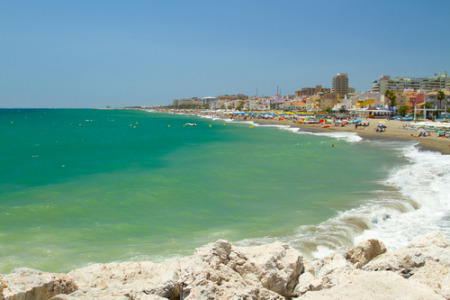 If it's fun you are after, Torremolinos and Fuengirola with clubs and bars open from dusk until dawn, may fit the bill. Nerja on the other hand, once a traditional fishing village, is a perfect resort for those seeking relaxation. The caves at Nerja, dramatically illuminated, are certainly worth visiting. If you tire of the beach, take a trip inland and visit charming towns and villages, often with medieval hearts, or visit Granada and explore Alhambra's Palace. Tourist accommodation in Spain generally reaches a high standard and the Costa del Sol is no exception. There are hotels and apartments catering for all budgets, offering accommodation from room only to all-inclusive packages. Eateries provide for all tastes and pockets. The large resorts cater for the UK penchant for Friday night curries and Sunday roasts. If you are into shopping, try Marbella's Golden Mile which is filled with boutiques and upmarket stores. Remember, window shopping costs nothing. Cheap holidays to the Costa Del Sol. If you are looking for a cheap Costa del Sol holiday you have chosen the right website. As a price comparison site we can search for holidays from almost three dozen travel companies. With such competition, you can be sure of a good deal. Our easy to use search facility will lead you the company offering the cheap Costa del Sol holiday that is best value. Make your phone call and you could be on your way. Interested in Costa Del Sol? This is where you’ll find handy, helpful advice and ideas that’ll save you time and money when you’re going on holiday. HDC Investigates: -Are More Brits Heading Abroad for Stag and Hen Parties? Holiday Deals: Don’t Wait for Summer! - Summer is so far away! So why not book a cheeky trip away in the next few months.